Brewing on the Island reaches back to the last millennium when ale houses brewed their own beer. From around 1600 breweries were established to serve more than one outlet. An Island businessman, Jermyn Richards, owned one such brewery in Brading and sold beer to the fleet of ships easily accessible via the harbour. Two hundred years later, in the 1800's there were seven breweries which included Shanklin Brewery, Eagle Brewery of Ryde, Sprakes brewery of Chale Green and Castle Brewery Sandown. One of the biggest was established by the Mew family in Newport, centrally placed to serve most of the Island. Later, Mew-Langtons became famous for their canned IPA (see below). Probably the best known of the Islands breweries today is Burts of Ventnor. Burts was established in the 1840's and has always brewed in a traditional manner. Some of their success stems from the unique water source, tapped directly from St. Boniface Down, which towers above the brewery. In 1850, the owner James Corbould reached an agreement with Thomas Page of the Ventnor Water Company that water would be supplied at 6d (£0.025) per year for the next 1000 years! One wonders if Thomas Page liked his pint! Burts disappeared from the Island some years ago and I believe their 'tied houses' were sold. Fortunately they are back again with beer tasting every bit as wonderful as it ever did. 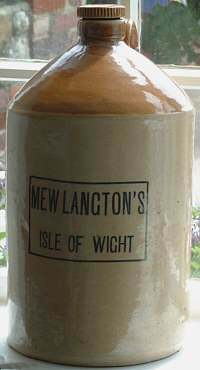 Towards the end of the nineteenth century, the local brewery Mew-Langtons developed a revolutionary way of storing beer - they developed screw-top cans instead of the more traditional bottles. 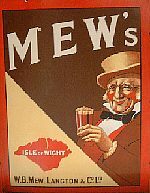 The Mew-Langton brewery located in Newport, was in an ideal position to serve the military being close to Portsmouth. To enable beer to stay fresh it needed to be stored under pressure with a layer of carbon dioxide. Glass bottles were often too fragile. Beer destined for India in particular would often arrive flat. So the newly developed India Pale Ale in cans was sent instead. At one time this was an export beer but has since had periods of popularity - IPA was a popular beer in the 1970's but became less fashionable when 'real ale' made 'gassy beers' less desirable! In 1993, Whitbread (a UK brewing company) issued a series of collectors cards with their Island pubs as the theme. These cards are now rare and attract a high price at collectors' fairs. Click on the thumbnail for an enlargement and details of the 'pub'. Kevin Mitchell (whose books appear above) has a great website. Local branch of the Campaign for Real Ale site. Save the pint website. Visit this site if you think the new law that makes it illegal to sell a pint of shandy is daft!